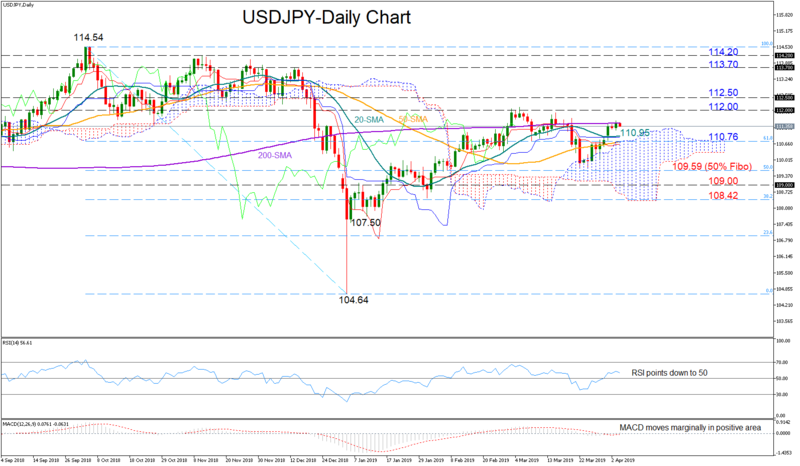 USDJPY bounced back above 111 this week but the 200-day moving average (MA) managed to hold the bulls under control, with the market now set to close with minimal weekly gains. The short-term bias looks positive-to-neutral under the technical perspective as the RSI is losing ground in bullish territory (above 50) and the MACD is rising marginally above its trigger and zero lines. In Ichimoku indicators, both the red Tenkan-sen and the blue Kijun-sen indicators continue the sideway move, suggesting an uninspiring trading for the short term. Should the price overcome the 200-day MA, immediate resistance could come from the 112 psychological level, while slightly up, last year’s frequently-tested area around 112.50 may also prove challenging. Another leg higher would shift attention towards the 113-70-114.20 region, where any break above it could bring more bullish action to the market, confirming the sustainability of the December uptrend. On the downside, support could be met between the 20- and the 50-day MAs (110.76-110.95) where the 61.8% Fibonacci of the downleg from 114.54 to 104.64 is also placed. Further losses would aim for the 50% Fibonacci of 109.59 which the bears found hard to clear late in March. However, If the latter proves easy to get through, the next stop could be somewhere between 109 and 108.42. Meanwhile in the medium-term picture, the three-month view remains neutral as long as the price remains trapped within the 112-107.50 zone. Yet, the positive slope in the 50-day MA, which is pushing hard to reach the 200-day MA, provides some confidence that a bullish outlook could resume once the lines cross each other.